The function of carbon filter kits is to absorb organic particles and other airborne materials produced by the plant during growth and blooming. The process involves the filtration and evacuation of biological particles and other airborne materials produced by the plant. 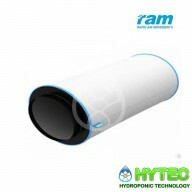 The RAM Pro-Active Carbon Filter Range is a professional range of filters designed with the grower in mind. Guaranteed to do the job – it is easy to use, value for money and flexibility – this range is offered in a variety of sizes. All our RAM filter kits are supplied with 5 meters of Combi-ducting, three quick clips of the size kit you require & a pair of rope ratchets! This filter uses virgin Australian RC412 Carbon, widely considered to be one of the superior carbons for air filtration. With its very low ash content (less than 13%), it is a pure granulated product so it can be compacted very tightly, leaving no air spaces for organic compounds (odours) to escape. 100mm x 200mm Rapid Air Movement Charcoal Filter The 4 inch RAM carbon filter from Rapid Air Movement is one of the best value charcoal filters available today. Measuring 100mm x 200mm, the high quality 5inch RAM filter runs at 170 m3/hr. The RAM Pro Active Carbon Filter Range is a p..
150mm x 470mm Rapid Air Movement Charcoal Filter The 6 inch RAM carbon filter from Rapid Air Movement is one of the best value charcoal filters available today. Measuring 150mm x 470mm, the high quality 150mm RAM filter runs at 500 m3/hr. The RAM Pro Active Carbon Filter Range i..
150mm x 600mm Rapid Air Movement Charcoal Filter The 6 inch RAM carbon filter from Rapid Air Movement is one of the best value charcoal filters available today. Measuring 150mm x 600mm, the high quality 150mm RAM filter runs at 700 m3/hr. The RAM Pro Active Carbon Filter Range i..
200mm x 600mm Rapid Air Movement Charcoal Filter The 8 inch RAM carbon filter from Rapid Air Movement is one of the best value charcoal filters available today the high quality 200mm RAM filter runs at 850 m3/hr. air flow The RAM Pro Active Carbon Filter Range is a pro..
315MM X 800MM RAPID AIR MOVEMENT CHARCOAL FILTER The 315mm RAM carbon filter from Rapid Air Movement is one of the best value charcoal filters available today. 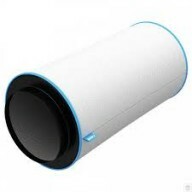 The high quality 12inch RAM filter runs at 1350 m3/hr is 315mm neck and a length of 800mm. The RAM Pro Active ..
315MM X 1250MM RAPID AIR MOVEMENT CHARCOAL FILTER The 315mm RAM carbon filter from Rapid Air Movement is one of the best value charcoal filters available today. The high quality 12inch RAM filter runs at 2400 m3/hr is 315mm neck and a length of 12500mm. The RAM Pro Active Carbon Filt..